I pulled it up in EQ7 and came up with an idea for you. I don't know how to move the picture from EQ7 to this forum so will try to describe it. The Storm at Sea consists of (1) a small square (square in a square in a square), (2) a large square (square in a square in a square), and (3) a rectangle (diamond in a rectangle). 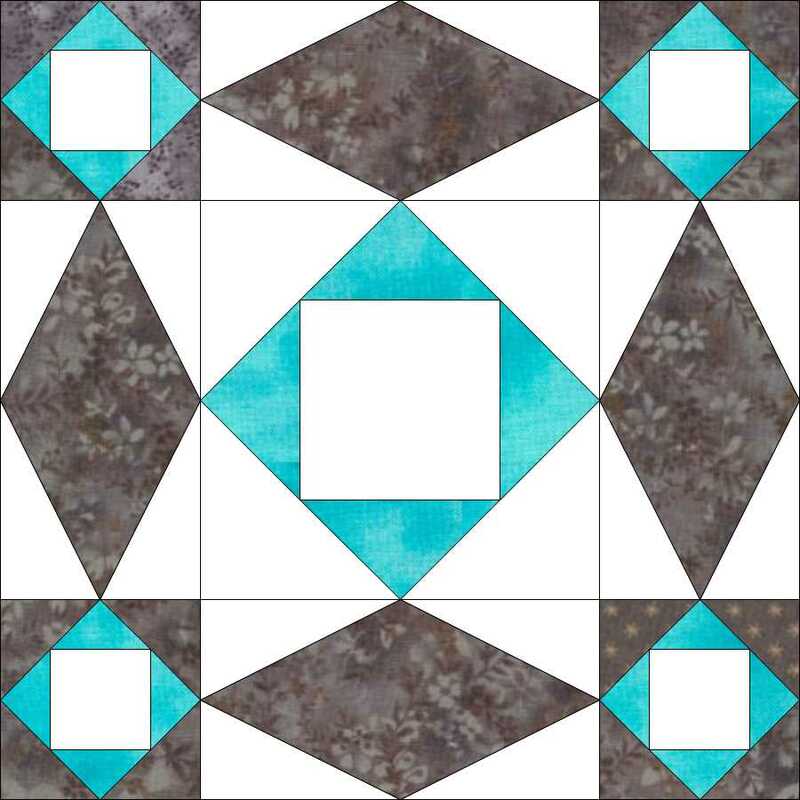 For the small square, a light center, next the aqua, and the grey/brown on the outside. Sorry I can't describe it any better than that. Hope it helps. Hi Audrey. I don't have EQ7 so may have to cut some small pieces of fabric to see how it will look, using your idea. My friend doesn't want the darker shades but I think they'll have to be included, for contrast. Will also try using colouring pencils on graph paper. 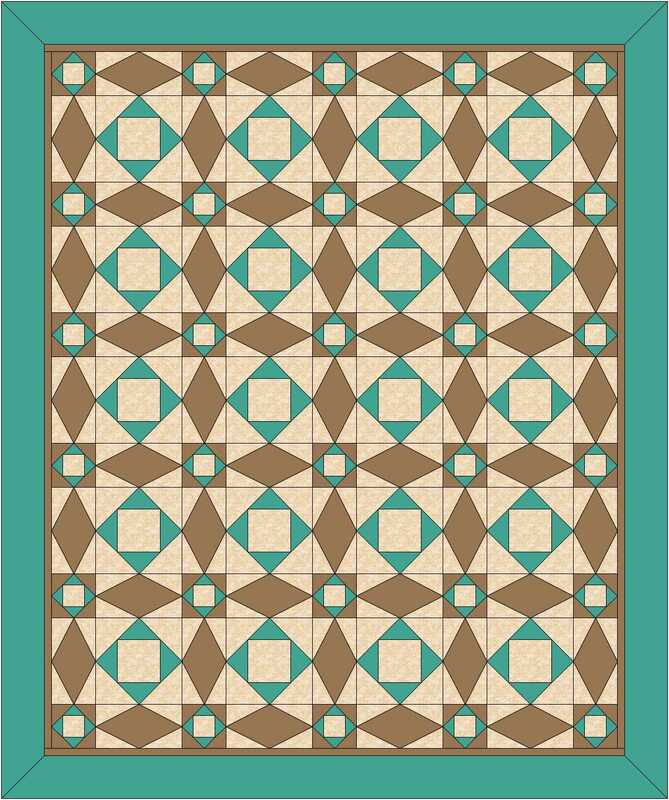 Have I heard somewhere that you can save [or export] your blocks and quilts as a jpg -or whatever- in EQ? this link has a coloring chart if that helps. Okay, I don't know how to post a picture. I'll research it and try again. Oh, thank you. I tried to post a picture but can't seem to do it. I'm still trying but I'm having technical problems. If the white is a color you're adding, and not one that your friend requested, I think there's way too much of it in that arrangement (the one pictured by btiny36). Personally, I wouldn't use any white at all, just stick with several different values of the aqua and grey/brown. It'll look much more fluid. Okay, I think I have figured out how to upload the picture I did in EQ7. Hopefully it works. I would go with the darker tones for the 'curve' pieces, to represent the waves. I would also use the single sash block (the basic one) and not the double sashed block. It is way more fluid looking and is the original intent of the pattern. Pics for comparison, and, though not in the colors requested, the values depict waves and motion. Depending on how dear this old friend is, you could do one of the heart outlines in a slightly different shade from the others so it very subtly shows. Thank you, all, for your helpful tips and comments, and the images. Have noticed they only have 3 or 4 colours in each which is beaut, and I will save them all for reference. First I have to finish my DGDs quilt, which is another puzzle to be solved-as-I-go. Will try to post the photo when finished. My friend & I lived opposite each other since 6 yrs old, we're now 67, and have kept in touch over distances and time. She doesn't sew, and what else will I do with all these quilts on my to-do list but store them in the cupboard? There are bunche of photos. I much prefer the tranditonal white, med. blue and dark blue, with just one wave. I agree with ghostrider about the single sashing. The double loses the "storm". I also like white or at least a lot lighter "light" color. Anytime I have a problem like this, I have to remember that crayons are our friends. Make a few copies of the pattern and experiment with different coloring. Storm at Sea is one of my favorite patterns because it can come out so many ways. Don't forget that it is not against the rules to put the same color in adjacent squares. You can also vary the look a bit by making the outside squares wider or narrower. 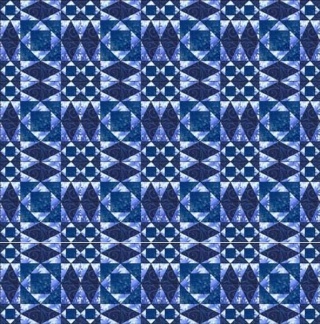 Love this pattern! I have the book "THE QUILTMAKER'S GIFT" Got it at an estate sale for $5.00. 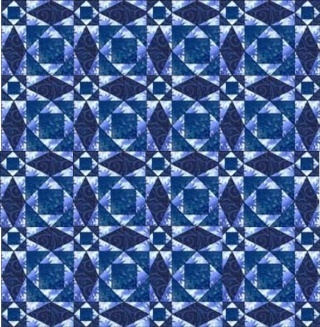 The pattern can also be found at FREE QUILT PATTERNS.COM You can download it. 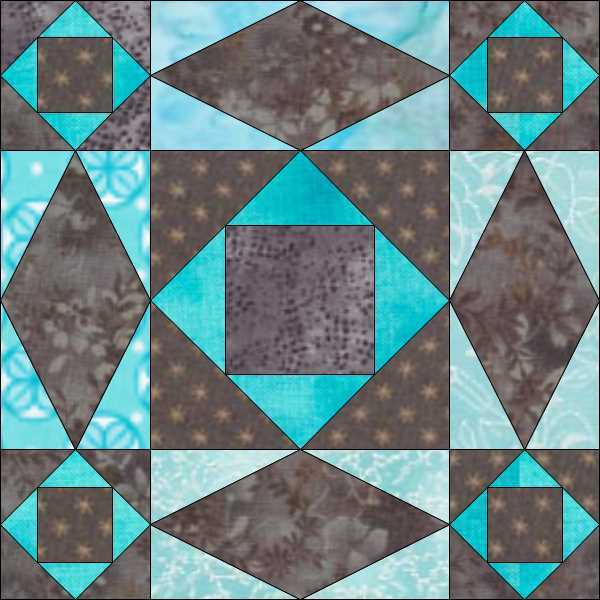 I want to try this block/quilt. I live in Florida and collected Light houses two years ago on a Shop Hop. 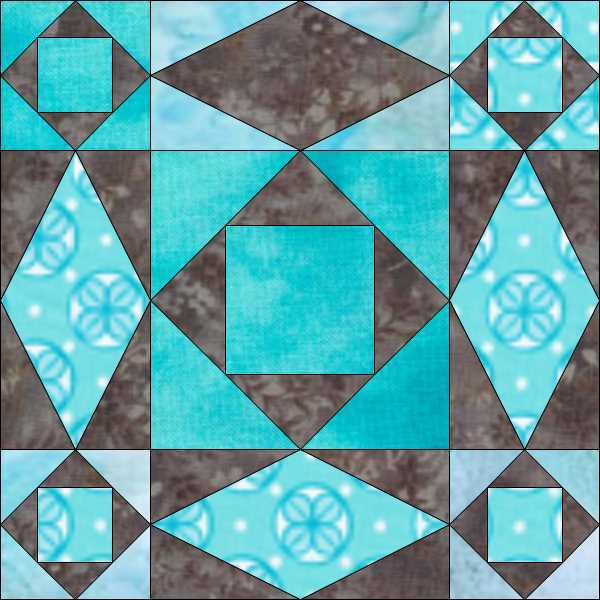 I saw where some one did the Sea Storm quilt putting the Light houses in the center of the blocks totally awesome. Can some one explain how to do this block with the center beginning 8 inches. Here is a diagram that shows you how to draw your own block, it's quite easy if you note the numbers. You can cut out some of the sections as templates, but don't forget to add 1/4" all around for seam allowances. This will make the centre block cut at 8 1/2'', so if your lighthouse blocks are only 8" you may need to add 1/2" to two sides, or downsize all pieces. Actually, if your blocks are only 8", you may not need to add the 1/4" to any pieces.